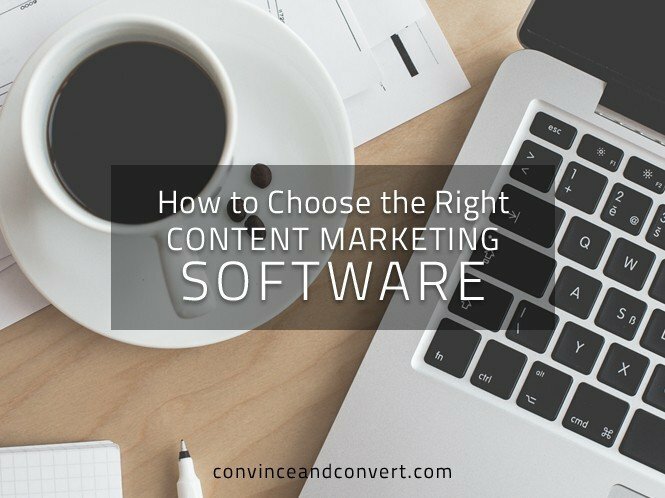 It’s not easy choosing the right software for your content marketing efforts. Luckily for you, I’m here to help. The reason it’s so hard is that there are so many requirements for an effective content marketing strategy. While there have been plenty of attempts to make sense of all the different software choices that are available to you, they tend to confuse and daunt more than help. Given their desire to categorize everything on a level playing field, these diagrams tend to force each logo into a single bucket of functionality which results in pigeonholing every vendor as a “point solution” that does only one thing well. Not every software vendor is a point solution. Many touch on a variety of functions and processes across marketing as a whole, while others truly do focus on one small piece of the puzzle. Other attempts, like this one, only hit one note of what makes software “content marketing” software: how many integrations it provides to other software vendors. Otherwise, it uses signals like how many social media followers that vendor has. That may help you determine if a vendor is established, but that’s about it. It’s a one-dimensional assessment much like the landscape diagram. In order to uncover the right solution, we must first break this mold and give content marketing the more accurate, thoughtful, three-dimensional perspective it deserves. It’s also important to realize what’s been happening in digital marketing as a whole. It has evolved. Although we’ve been using social media management software for a decade and marketing automation platforms for years, we continue to use those solutions—just more so for marketing content than ever before. As a result, those solutions are now part of an effective content marketing strategy. When content marketing gets described, it somehow gets placed beside these other marketing functions as if it’s the new kid on the block, when in reality, it is the new umbrella under which those solutions sit. “Creation” is the process of, well, creating content. “Distribution” is how you get eyeballs to your content, and “Insights” means the measurement and reporting on those eyeballs. But this is a rather flawed perception. Where in this flow have we figured out how this content will actually be presented or managed? 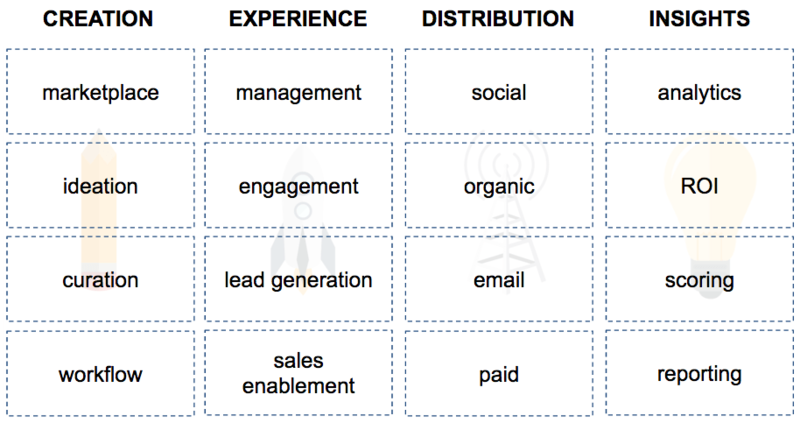 Where is lead generation taking place? What is actually getting distributed on social media? At Uberflip, we’ve been touting a resolution to this misperception for some time. Behold: the fourth pillar! “Experience” is the way in which content is consumed, the destination of what is being distributed, and where lead generation takes place. Your content experience is the very essence of how your incredible content is packaged for your audience to devour. Without a great experience, you’re serving piña coladas in a garbage dump instead of on a sandy beach, you’re riding a tricycle instead of a four wheeler, you’re playing a 3D movie on a small screen without providing 3D glasses, you’re… well, you get the point. The reason content marketing “experience” has been ignored for so long may lie directly in how our content distribution methods have evolved. One example of this is email. For over 15 years, we’ve primarily been sending our prospects content via email. In the early days, this content included newsletters right in the body of the email, PDFs, and sometimes even video files as an attachment. Solutions like YouTube (a better video “experience”) allowed us to link out to that video content and use the email only as a call-to-action. Video is the most obvious example, but if you attach a PowerPoint file today instead of using a solution like SlideShare, or a PDF instead of using a Flipbook provider like Uberflip, you’re not only serving up a poor user experience—you’re missing out on user metrics and an opportunity to continue the content journey. I’m not knocking email. Email has been around a long time, and it’s not going anywhere. But today, email is most effectively used as a call-to-action that drives people to content experiences on the web. It’s one of several distribution channels for effective content marketing. All that said, content experiences are by no means a new idea. We’ve been building out WordPress sites for over a decade! But while CMS’s like WordPress are great for your website and blogs, all those other forms of content (e.g., videos) can either be shoehorned into blog posts or consumed on non-owned experiences like YouTube. And then of course there’s the rise of mobile. If you’re sending visitors to non-optimized experiences for their screen size, you may as well have a big “goodbye” as your headline, as that’s all they’re going to read. What I’ve done here is further break down each pillar of content marketing into its parts. These are simply more refined pillars, or “buckets”—most of which can be further refined if we felt compelled. 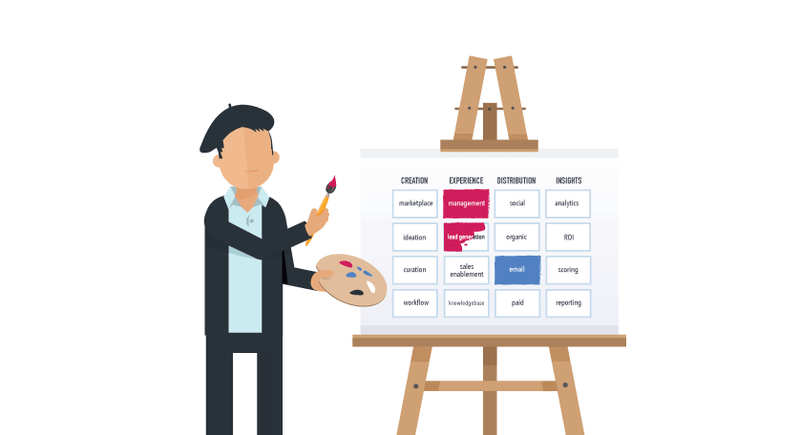 For example, you could chop “experience > management” into smaller buckets like traditional “CMS’s” (think WordPress), “landing pages” (think Unbounce), “content hubs” (think Uberflip) and even “video players” (think Wistia or Vidyard). You could also mix in content recommendation engines like BrightInfo and personalization software like Optimizely that enhance or improve those experiences, or data enrichment software like DemandBase or ReachForce to fill in the information gaps on your leads. There are numerous platforms and point solutions that touch or “own” a portion of content experience management, much like there are ones that touch or own other buckets within the other pillars. Using this model allows us to paint different solutions—whether point or platform—with more than one tone. What I mean by that is that many software vendors will easily fit in more than one bucket. Imagine those “landscape” diagrams where each logo got recognized for all the buckets of functionality it satisfied. Wouldn’t that be a better way to understand how software vendors participate in content marketing? Wouldn’t that make it easier to choose the right vendor? Doing so would allow us to break out of the mental box we’ve created and recognize that even social media management, SEO software, and marketing automation platforms are all a part of content marketing. Marketing automation platforms, which predominantly serve as sophisticated email marketing solutions, can be thought of as a point solution (albeit a mature one) within the distribution pillar. Even though these platforms have been around long before the recent rise of content marketing, it’s because of the aforementioned evolution of email marketing that they’ve squarely in the mix of effective content marketing. Marketing automation is rather limited without a healthy supply of contacts, or more bluntly, email addresses. And it goes without saying that the most effective way to build your distribution list these days is through effective content marketing. Social media sites like Twitter and YouTube, in combination with the vast number of software vendors that help manage those channels (think Hootsuite, Sprinklr, or Buffer), are ultimately helping us distribute content. They’re distribution channels and channel management software. Whether you’re marketing a new whitepaper or just trying to grow your following, if you’re into content marketing, then you’re doing both of those things squarely with the intent of leveraging those channels for your content marketing efforts. Social media is a distribution channel for marketing content. Gone are the days of keyword stuffing, but SEO is still incredibly important to your content marketing efforts. Why? Because landing on the first page of Google results will send more eyeballs to your content. SEO is your gateway to a very important distribution channel: organic search. That said, be careful not to overvalue SEO. 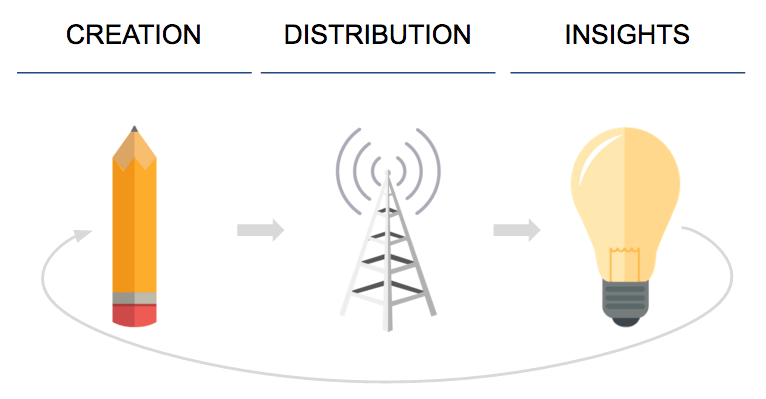 SEO serves only one of many distribution channels, where distribution is one of many pillars you need to satisfy. This is one of those tricky situations where you have to call a spade a spade. There are a number of established software vendors (think Newscred or Kapost) that are considered to be “content marketing platforms.” The similarity among all these vendors is their strength in the first pillar: creation. These platforms all have one or more elements in common: They’re either a place to purchase content (marketplaces), they help with ideation (what should I write about), they help with curation (where can I collect existing content from), or they help with workflow (how do I get my authors/creators working efficiently). While they all tackle a portion of the first pillar, they certainly don’t handle all of content marketing. They certainly don’t also include marketing automation functionality, social media management, SEO software, experience management, deep analytics and insights, and so on and so on… it’s simply impossible for one solution or platform to do it all. There’s nothing new about the process of content marketing. It’s a 100-year-old practice that recently got fitted with a shiny new title and place to be practiced: enterprise. When it comes to software vendors, there are no true content marketing software providers—for the same reason there’s no “internet software.” There are only solutions that satisfy a small or large part of the methodology and techniques of content marketing. You could argue that Oracle, Salesforce, and the like will continue to acquire software to build their respective “marketing suite” with the hopes of satisfying all those pillars and their buckets. But those won’t fare well in the long run. Modern marketers like you will want to choose vendors and solutions that are best-in-class for their respective function, rather than buying into false hopes of all-in-one suites. With integration solutions like Zapier and Cloud Elements, the connectivity of marketing software vendors just keeps getting tighter, and in a sense commoditizing the notion of “a suite.” At Uberflip, for example, we’ve been hyper-focused on building out our new API in order to enable not only our customers but also other vendors to build integrations in and out of our platform. Tightly integrating solutions is the only way marketers will meet the demands and best practices of an effective content marketing strategy. As the marketing software landscape continues to explode with new offerings, you will have even more choice when building your technology stack. As you evaluate vendors, it’s important to ask how each satisfies specific requirements, and how well it integrates with the rest of your stack. At the end of the day, it won’t be a single suite that dominates content marketing, but rather infinite permutations of marketing technology stacks that organizations like yours build to meet your unique needs. It’s up to you to build your content marketing software stack. Which pieces will you choose? Editor’s Note: A version of this article originally appeared on Uberflip’s Hub.